An influential committee of the UK parliament has warned that Britain faces big post-Brexit obstacles to reaching a free trade agreement (FTA) with the European Union if it were to leave the European Single Market. The report, Brexit: the options for trade, also warns that the UK will have little prospect, after Brexit, of continuing to have the level of access to third countries that it now enjoys through its membership of the EU. 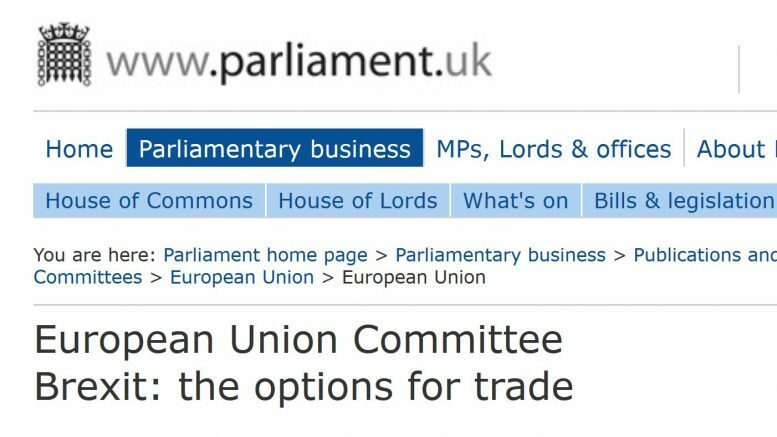 In a salutary report about the outlook for British trade options once it ceases to be a member of the EU, a House of Lords Select Committee says there is virtually no prospect that the UK will be able to reach new trading relationship terms with the EU within the two year deadline set for completing the Brexit process. This is because Brexit will fundamentally change the terms of Britain’s trade with the 27 EU member nations and with the rest of the world. This report considers the principal possible frameworks for trade after this time, namely joining the European Economic Area (EEA), a customs union with the EU, a Free Trade Agreement (FTA) or trade based on World Trade Organization (WTO) rules. It asks whether they might be modified—in line with the Government’s desire for a “bespoke UK agreement”— and explores the implications of the different options for the sequencing and timeline of negotiations. It warns that the UK is entering “unchartered waters”. And it also warns that if the EU is to agree to a FTA with Britain, Britain will be required to adopt EU laws and regulations – a prospect unlikely to appeal to Brexiters. The committee concludes that with little chance of a FTA being able to be agreed within the Brexit timetable it is vital that the government make it clear from the outset that it will negotiate transitional arrangements which will protect the British economy. “We urge the Government to establish at the outset of negotiations a clear strategy for a future transitional agreement, with specific proposals as to what form it should take,” the report concludes.